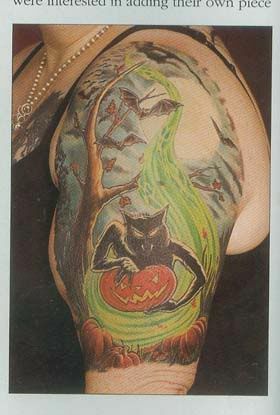 I always get a lot of comments on my tattoos & at the Showcase I had a gal asking about my werecat sleeve if it had been the one in Tattoo magazine & told her that yes, it had along with my backpiece. A while later a friend of hers came up & she went over & talked to him & he came over & asked if he could see my arm so I turned around & showed it to him. He laughed & said "you won't believe this" & rolled up his sleeve & showed me his version. Turns out the guy was so taken with the photo in the magazine he'd had his artist do their take on it for him. 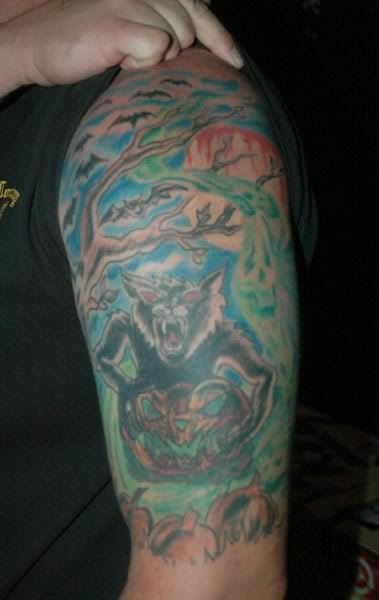 I know a lotta folks would be horrified if their custom work was copied but it was different enough & hey, how can I hate a guy with 3 Tiger Army tattoos (he also had the Tigerbat on his forearm pretty much where mine is (but thankfully NOT surrounded by black roses like mine tho he had a black rose on his other arm with "Never Die" written around it). I took some pix, asked him to please email me his name and the name of the tattoo artist so I could put 'em in the Tiger Army fan tattoo gallery on Ghosttigers.com, had a good laugh, & showed my friends the pix. What a small freaking world!